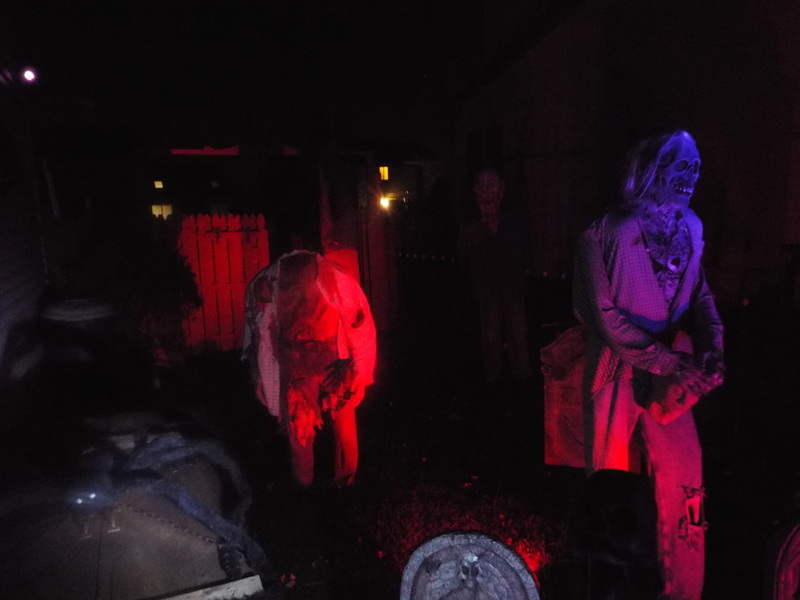 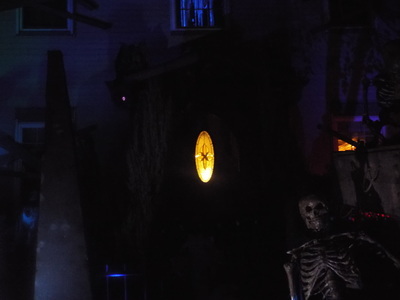 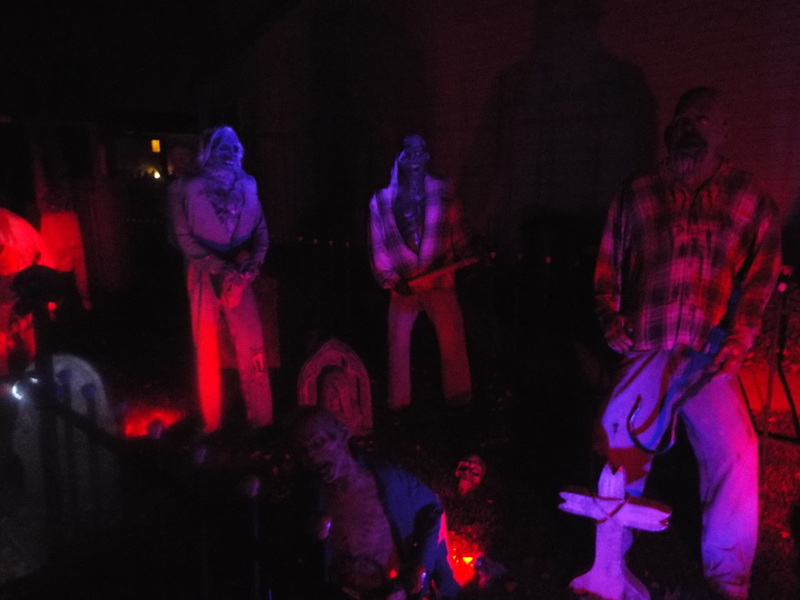 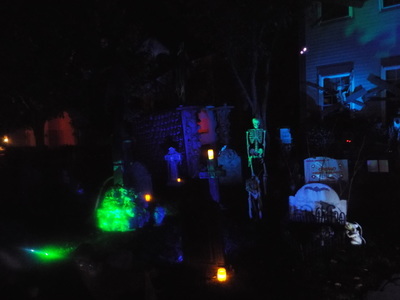 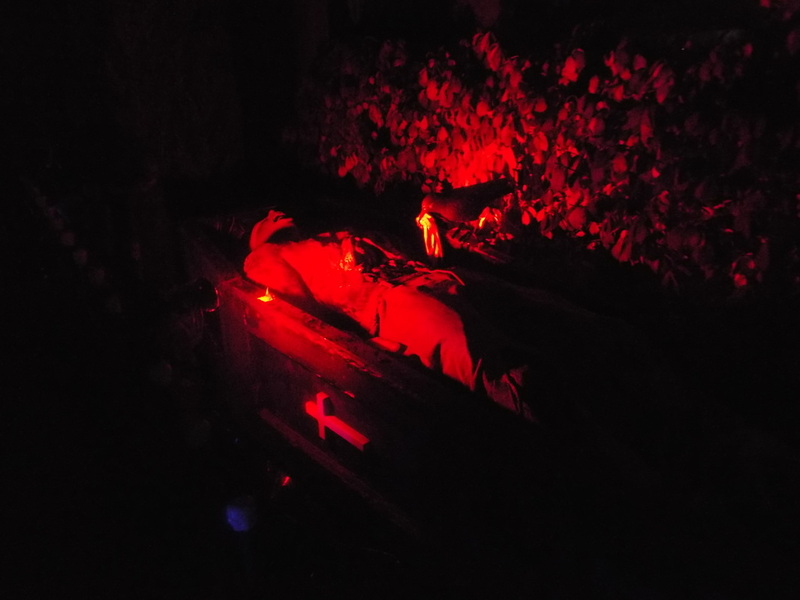 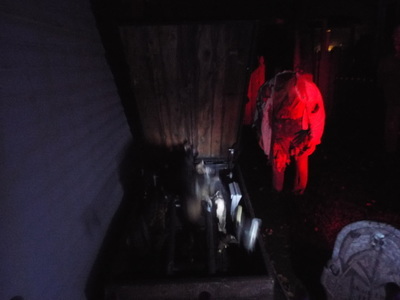 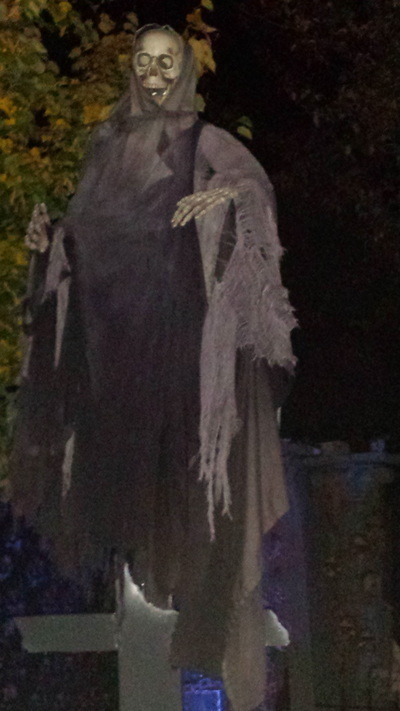 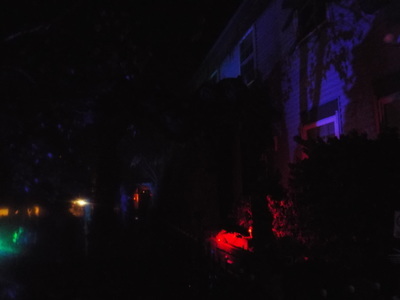 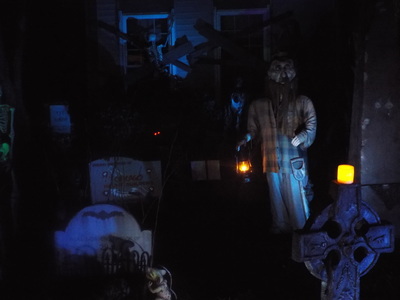 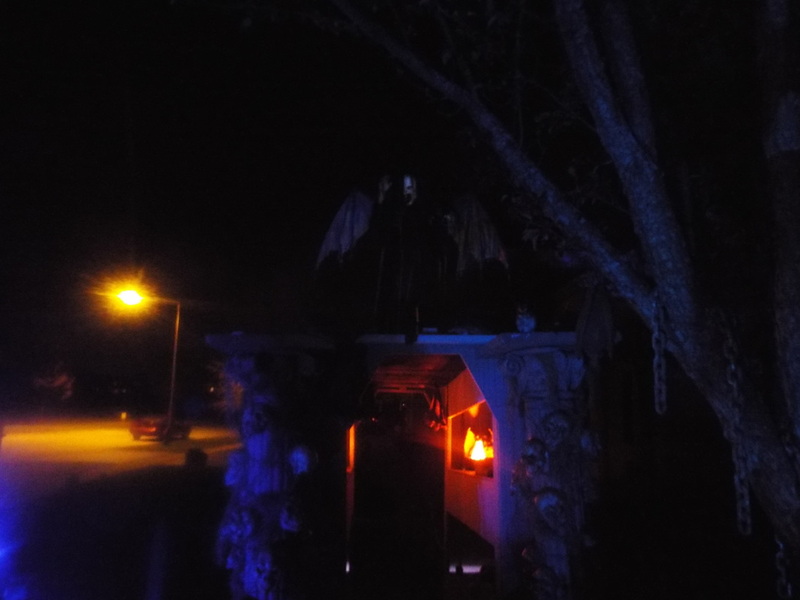 Our first visit to Haunt 31 was back in 2012, and at that time we saw only a smallish display in the garage and a bit in the front yard. We had heard a lot about the haunt, and came away thinking that maybe it was just a bit of hype. Then we heard the "it was early in the season and we weren't fully set up" story (which we hear quite often), and thought that maybe the next time we visited we'd visit a little later and see if there was truth to it. 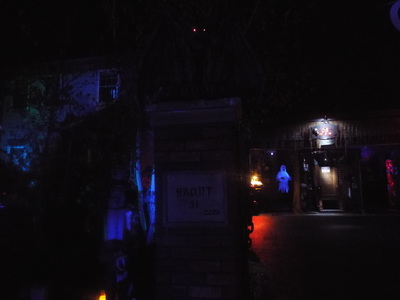 In 2014 we did indeed visit later and it turns out that there is a lot more to haunt 31 than what we first experienced. In addition to the garage and side area, this time the entire front yard (which is long) was filled with animated props and even a small walkthrough at the edge of the house. Mainly decorated like a cemetery, the front yard featured all of the standard cemetery sites, like lots of tombstones, skeletons, and even a creepy gravedigger in the middle of his job. 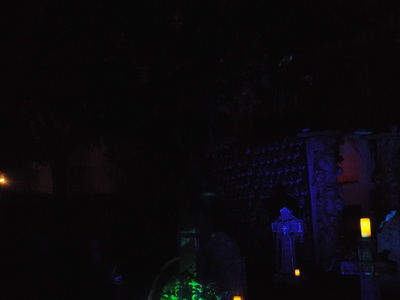 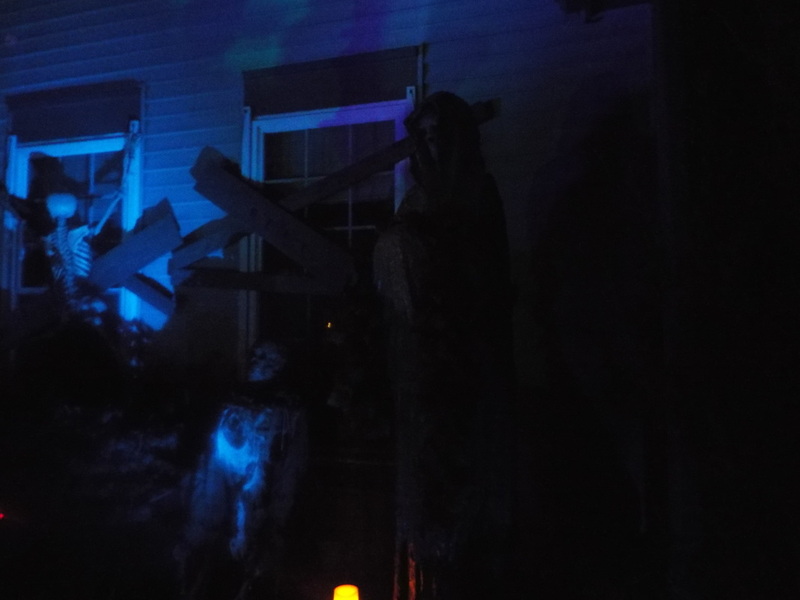 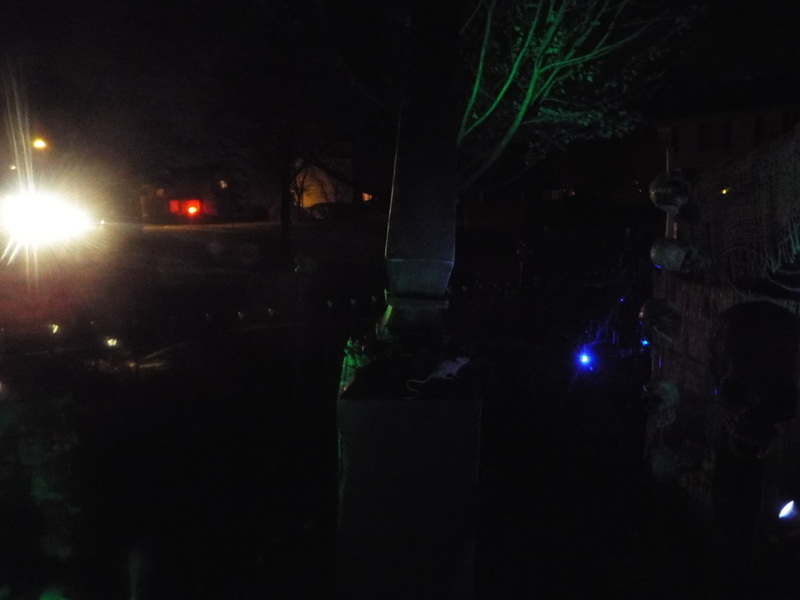 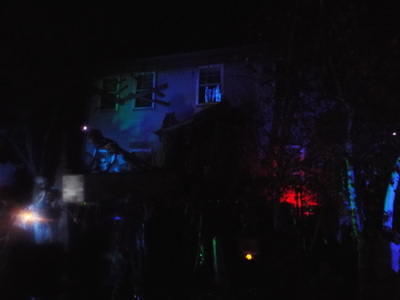 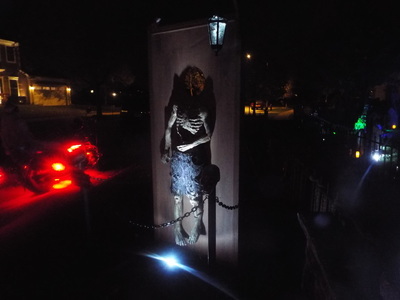 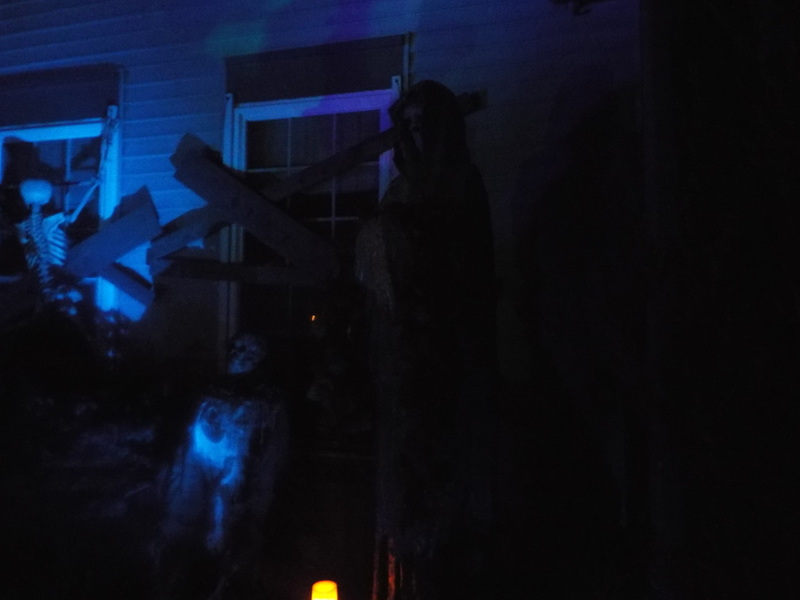 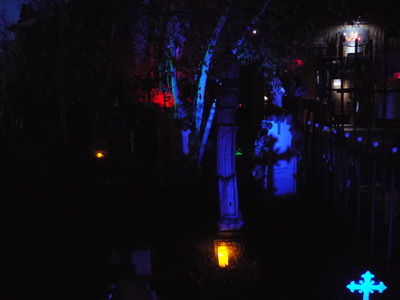 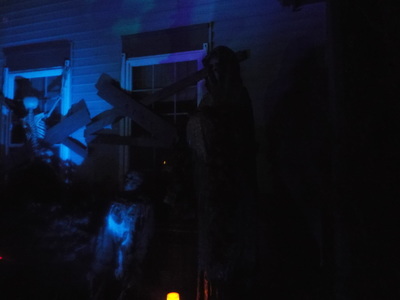 The main house, which served as a backdrop to the cemetery display, was boarded up as if condemned, and lit with some effective blue and green lighting. As mentioned, along the side of the yard display was a small walkthrough that looked like a crypt decorated with skulls and bones. 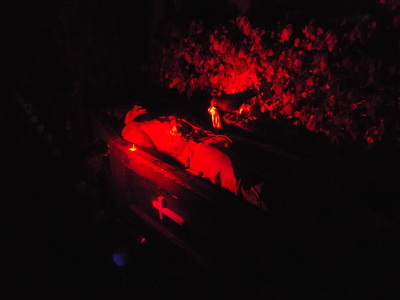 Along the way to the crypt were various pop-out scares hidden in the bushes and other places, including a great giant winged vampire-like creature above the crypt entrance that swept down onto unsuspecting visitors - really good stuff! 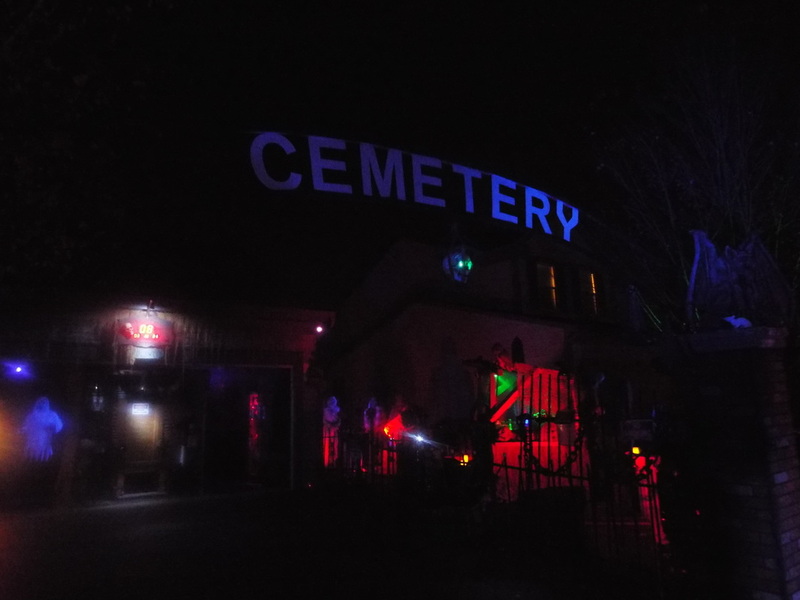 The entire display was surrounded by a fence with a large gate and metal sign on top announcing, as if anyone didn't know, that this was indeed a cemetery. 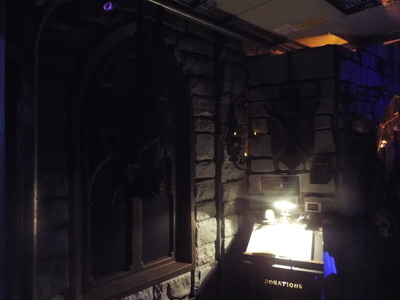 If this had been all to the setup then that would have been enough - it was excellently laid out, filled with some nice lighting and animations, and included some interesting surprises for the unwary. 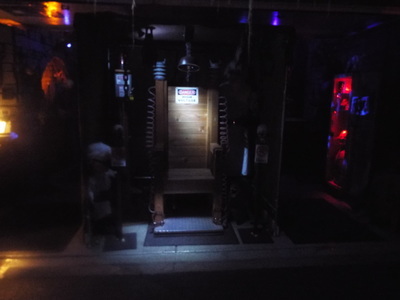 However, there was still more to see. 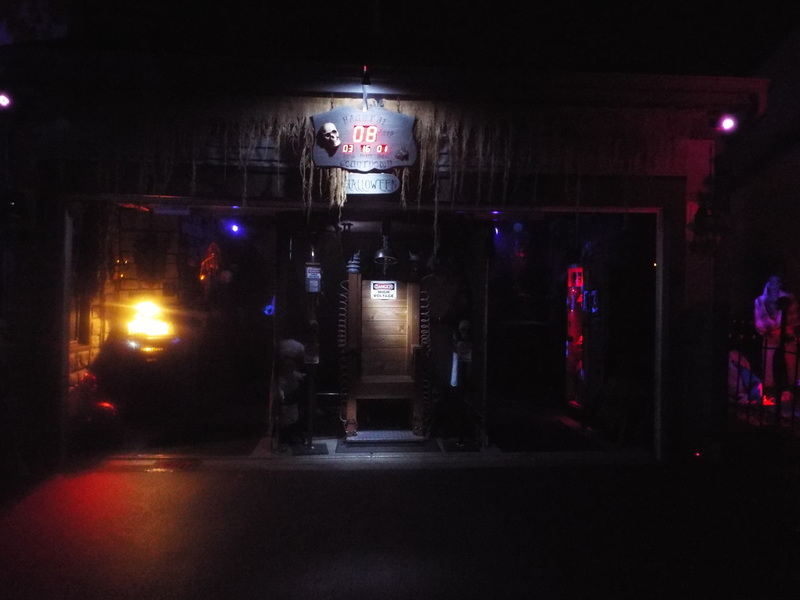 The inside of the garage was transformed into a U-shaped walkthrough that featured several scenes, all of them motion activated. 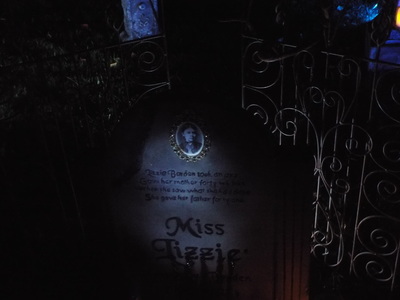 From a skeleton playing the organ to a corpse that popped out of its coffin towards visitors, to some creepy specimens in a display case to a mirrored tube that looked like a bottomless pit, all were very detailed and clever, and made the small walkthrough seem as if one was stepping into a professional attraction, perhaps at Disneyworld. 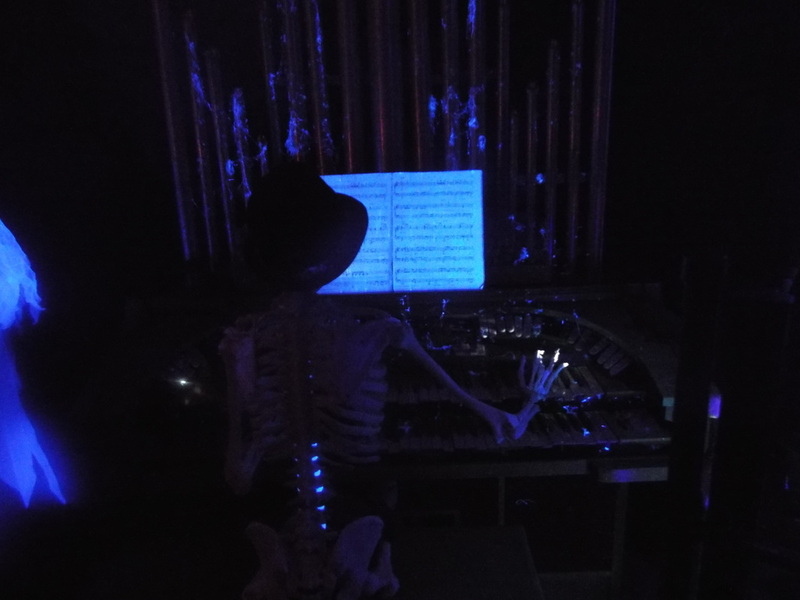 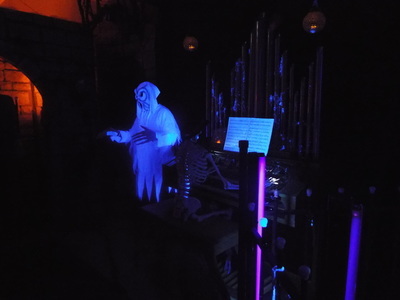 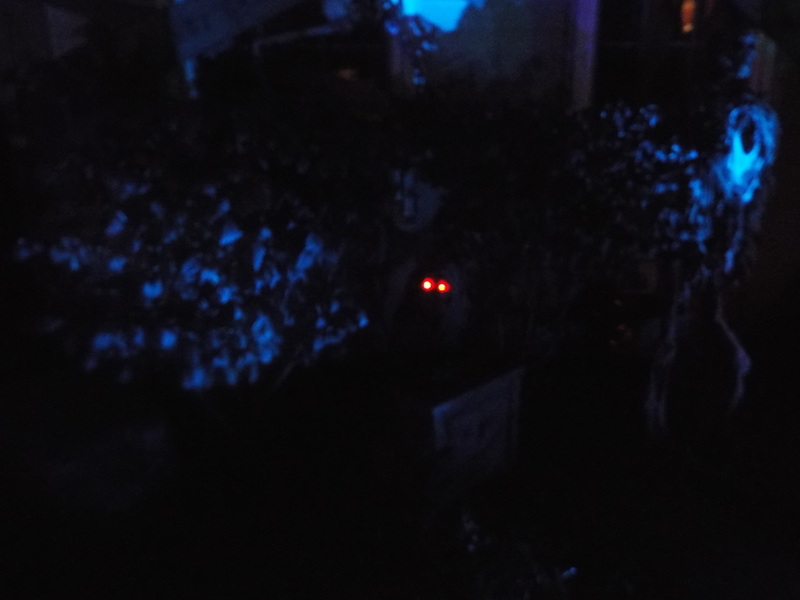 The best part of the garage haunt was a ghostlike figure next to the skeletal organ player. 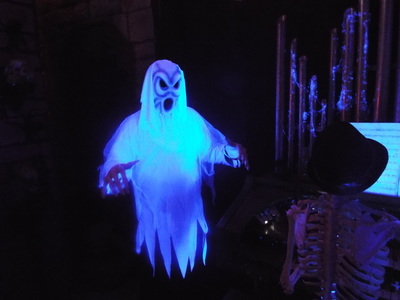 This ghost moved back and forth, slowly turning to face visitors and then turning back again. 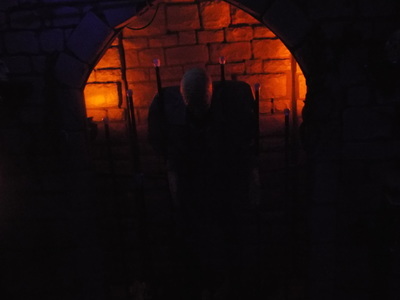 He was cool enough as is but (SPOILER!) 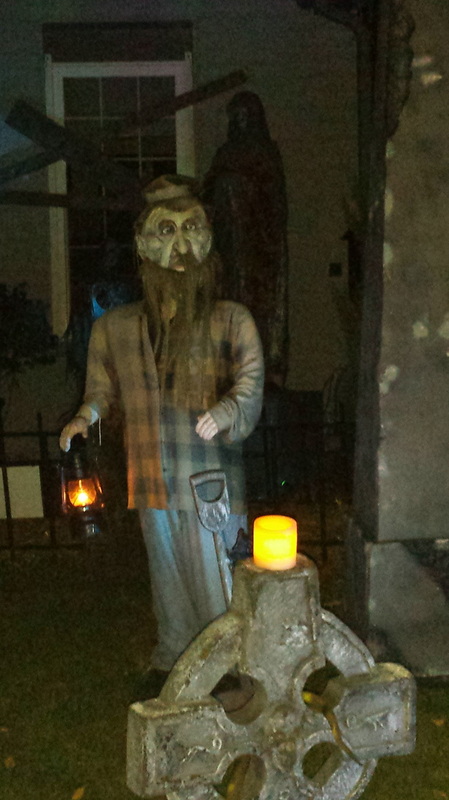 he was a real actor and jumped out at visitors. 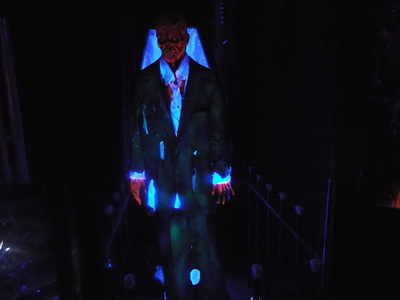 The key to his presentation was that he took his time waiting to pop out - when we were there we took a lot of time in the garage looking at all of the displays, and he never broke character the entire time, convincing us that he wasn't real - his movements were fluid and quite like the animated characters one can buy in a Halloween store. 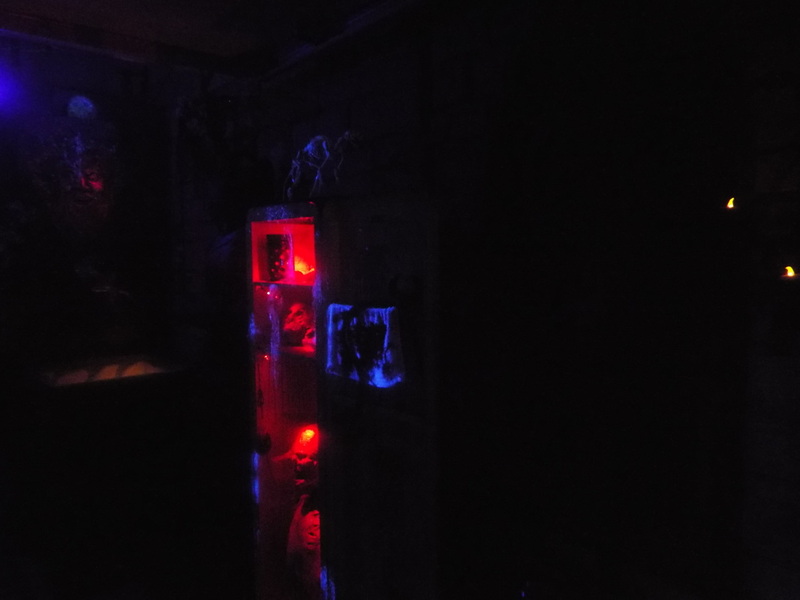 Very well done, and a mark of the attention to detail that Haunt 31 presents. 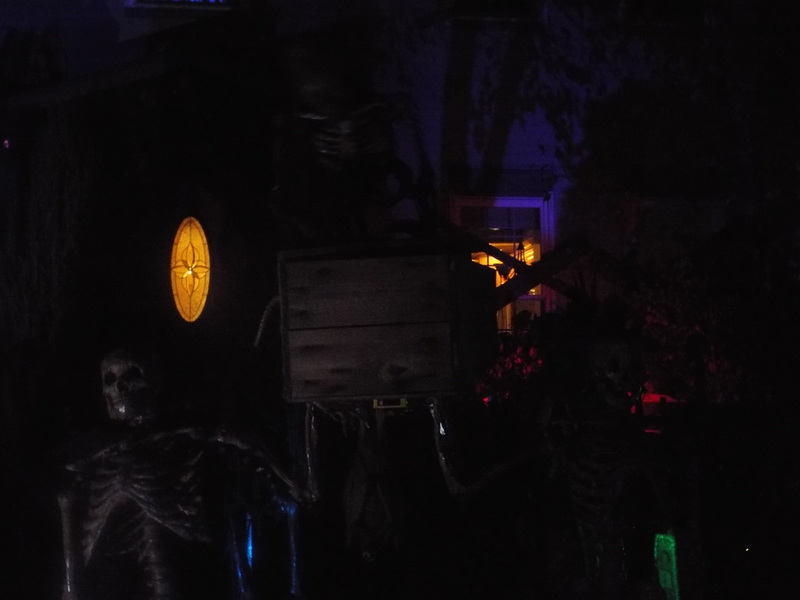 And the garage wasn't all, either. 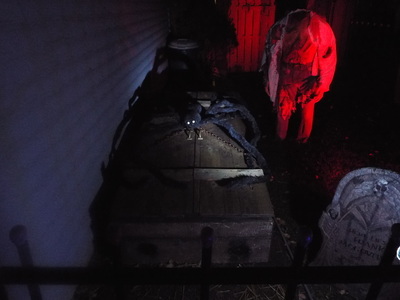 Along the right side of the house were more giant zombie figures, as well as a moving giant spider on top of a chained coffin that held another surprise pop-out. 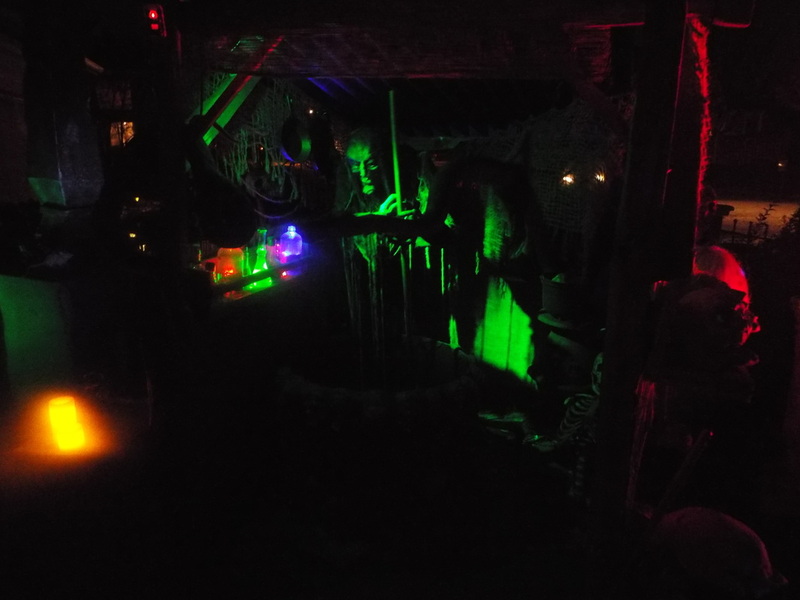 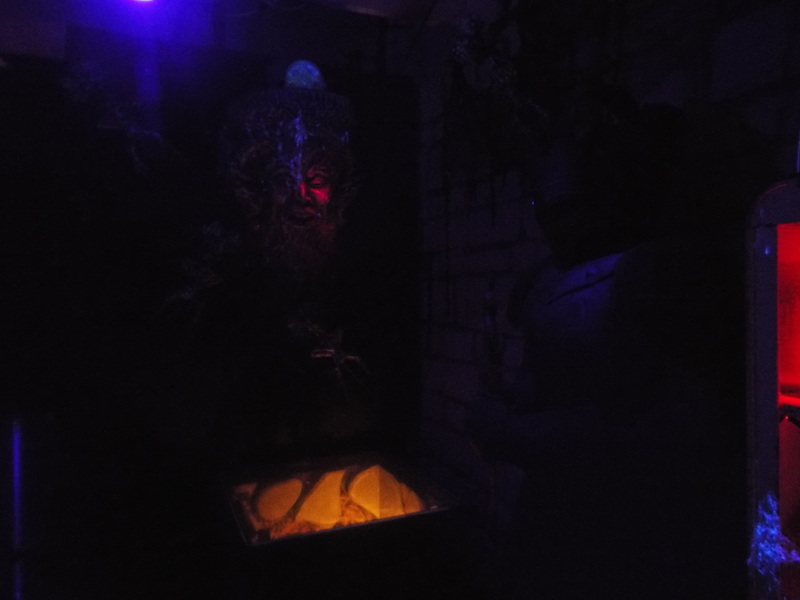 Also present was a life-size witches' hut, compelte with witch, giant animated snake, and bubbling cauldron. 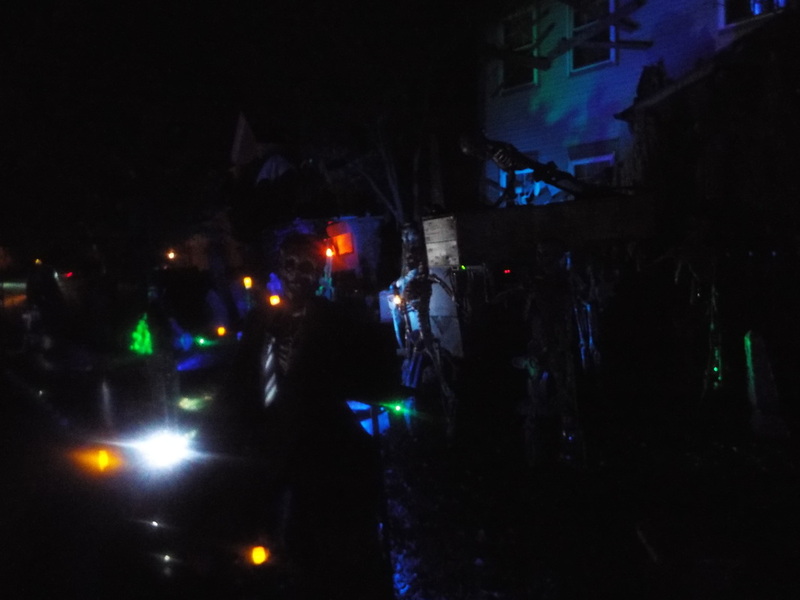 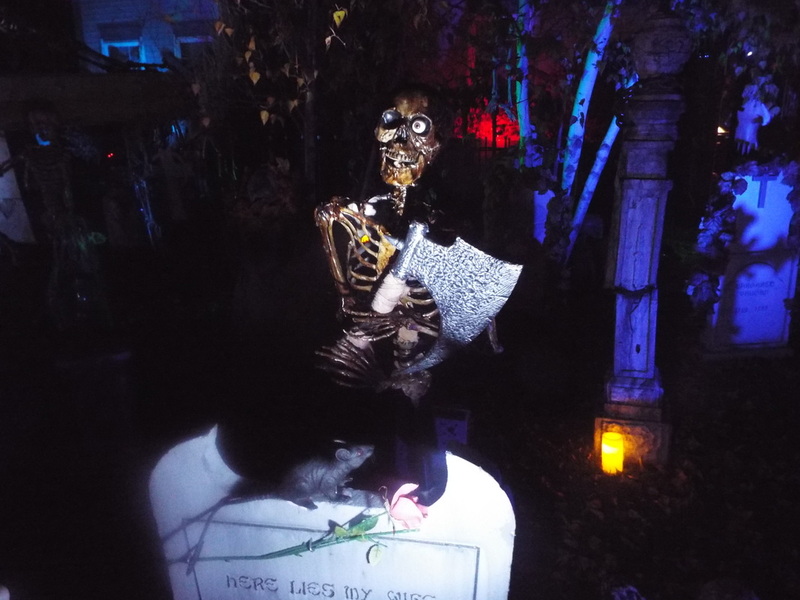 Haunt 31 may not be the biggest yard display we've seen, and it's definitely not the largest or most elaborate home haunt, but where it does excel is in the quality of the displays and the creativeness of the setup. It's got some nice startle scares, some very well decorated and highly detailed props, and it's got enough of a variety to make for a very pleasant visit, if only just to look at all of the great things on display. 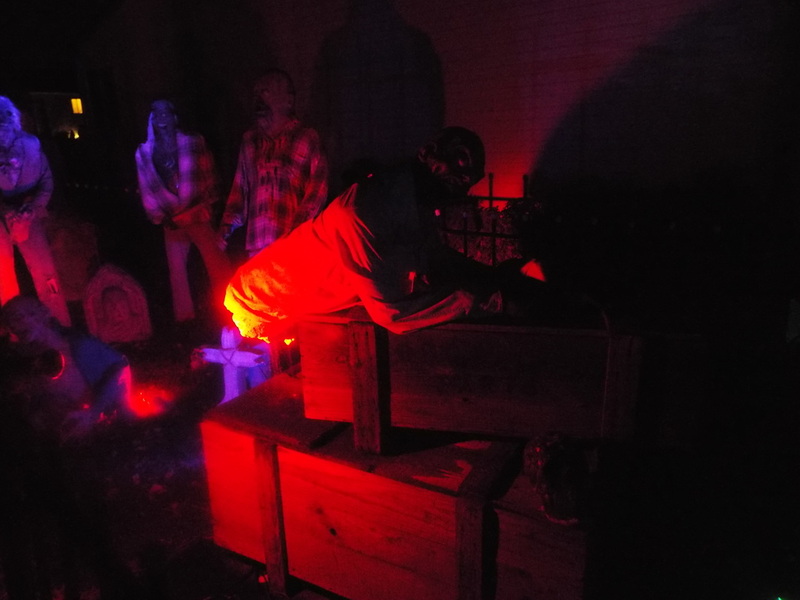 Overall, we are glad we made it back to Haunt 31 and we're happy that there was indeed more towards the end of the haunt season. 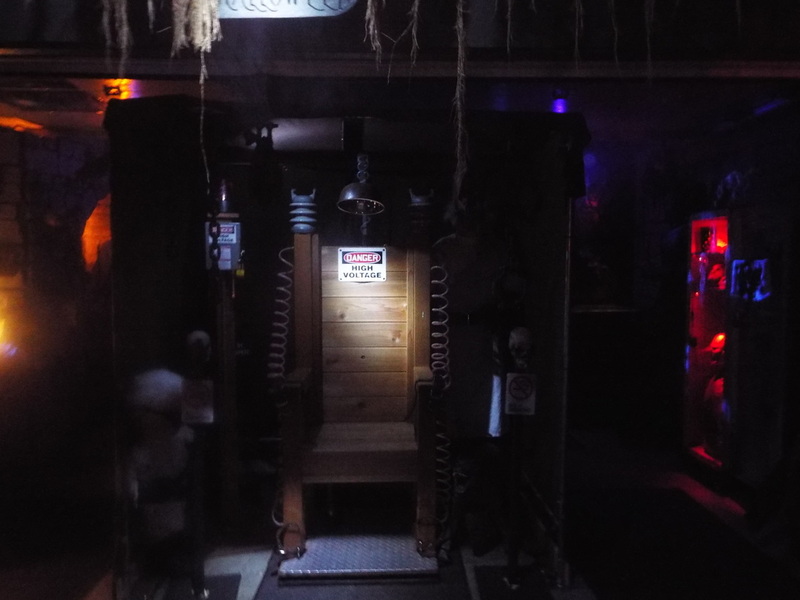 We can see why it has a good reputation amongst home haunters, and we're looking forward to our next visit!